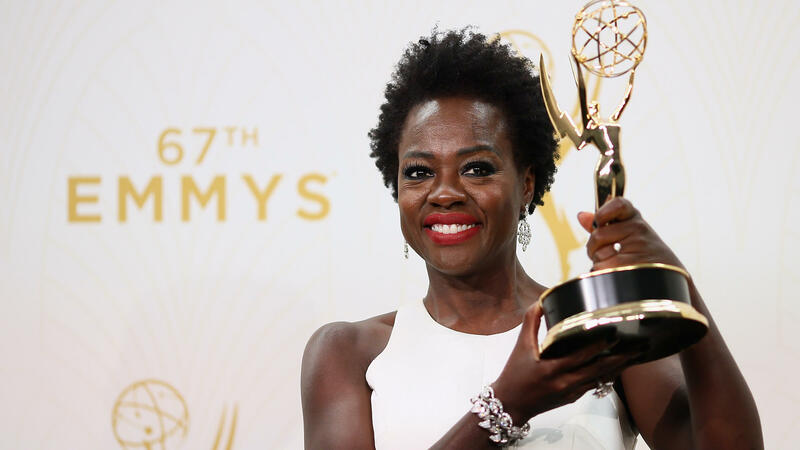 Viola Davis poses with her Emmy on Sunday night. The hard numbers on Sunday night's Primetime Emmy Awards told a story that could look a little dull to the glancing eye. HBO, representing the old guard of premium television at a time when more players are getting attention than ever, won 14 of the night's trophies, leaving the closest competitor — Comedy Central, with four — in the dust. Game Of Thrones, an extravagantly costumed fantasy epic that's been nominated five times, won for Outstanding Drama Series. Veep, which has been nominated four times, won for Outstanding Comedy Series and its star, Julia Louis-Dreyfus, won her sixth Emmy. Jon Stewart mostly cleaned up in the Variety Talk Show category, as he has approximately a zillion times in the past, and HBO's Olive Kitteridge rolled over everybody else in most of the Limited Series categories. There were parts of it, in short, that felt like an Emmy ceremony that could have happened 10 years ago, despite the entry of new networks like Netflix and Amazon and new shows like John Oliver's fantastic and genuinely provocative Last Week Tonight. And yet: it turned out to be a pretty great show. Andy Samberg, late of Saturday Night Live and now of Fox's Brooklyn Nine-Nine, has gotten better at selectively deploying the broader parts of his comic personality and made a solid host. He opened with a musical number tied to the currently popular theme of having way too much television to catch up on, which ultimately involved leaping into the arms of Nathan Fillion. So: again, solid. Reactions to Samberg's monologue were intriguingly mixed, but he laid down a pretty good burn on True Detective and declared that as shows shift categories, not only is Orange Is The New Black now a comedy, but "Louie is now technically jazz." He also managed to both salute the diversity of the slate relative to past years and call out what a teeny accomplishment that actually is with the line, "Racism is over! Don't fact-check that." Over the course of the evening, though, it was the awards and honorees themselves that provided enough good stories that the show (which came in on time, by the way) didn't drag. Jeffrey Tambor has never won an Emmy before, which is pretty surprising given what an indispensable actor he's been for decades, and seeing him win for his portrayal of Maura on Transparent — the kind of role that didn't seem likely to ever come to prominence even five years ago — was delightful. Tambor, like a lot of these winners, has a story, and because it's a story about being a great artist for a long time, the victory becomes particularly satisfying. People who watch awards shows are looking, in the end, for a story, just as much as the people who watch anything else on television. Case in point: Regina King is a fabulous actress who goes back not only to the TV show Southland and movies like Ray, but all the way back to Jerry Maguire and, in 1985, the comedy series 227. Sunday night, she nabbed an Emmy for her supporting work in the limited series American Crime, and seeing her on stage was ... well, somebody was kind enough to tweet a GIF of the actresses she beat as they reacted, and I think you'll agree this is not ordinary "pretending to be gracious." Uzo Aduba won for Outstanding Supporting Actress in a Drama Series for Orange Is The New Black, which made her the second person (after Ed Asner) to win in both Drama and Comedy categories for playing the same character. (Last year, she won for Outstanding Guest Actress in a Comedy Series.) As she sobbed and thanked her sister, it was hard not to find that a pretty good story as well. Jon Hamm, on his eighth and final nomination for Mad Men, finally won. While the show itself has won (and won and won), its quite brilliant cast has been shut out for its entire run. His acceptance, preceded as it was by a lovely glimpse of his ever-present goofball streak as he crawled (rolled?) onto the stage instead of ascending the stairs, turned out to be quite heartfelt and, again, pretty satisfying for people who got eight rounds of marvelous TV out of the guy. But bar none, slam dunk, no contest, the speech of the night was from Viola Davis, accepting the award for Outstanding Lead Actress in a Drama Series for How To Get Away With Murder. She was the first black actress to take home that award, but as she was quick to point out, the real takeaway is how few black actresses have ever had the opportunity to compete for it: "The only thing that separates women of color from anyone else is opportunity," Davis said. "You cannot win an Emmy for roles that are simply not there." It was particularly interesting to look at Davis' speech alongside the Apple Music commercial that debuted during the ceremony and also sparked a lot of positive reactions — it follows Taraji P. Henson and Kerry Washington to Mary J. Blige's house for a hangout that looks like probably the most fun anyone could have, and it was directed by Ava DuVernay. Going back to the point Andy Samberg made in his monologue, it's hard to argue that any Emmy Awards ceremony necessarily is a great night to be a woman of color on the whole (actresses are one thing, after all; writers and directors are another), but between Davis, Aduba, King, Henson and that commercial, it seemed to be a much better one than usual, which is something. What finally stood out about Sunday night's awards was what classy problems you have now as an Emmy viewer. The biggest problem was that there were, in most categories, multiple people whose work was deserving; multiple people it would be absurd not to be happy for. It would have been great to see Elisabeth Moss win for Mad Men, or Tatiana Maslany for Orphan Black, or Henson for Empire for that matter, but Davis winning was stupendous. It would have been great to see Amy Poehler win for Parks And Recreation, but Julia Louis-Dreyfus is fantastic on Veep. Tony Hale is, too, but Andre Braugher winning for Brooklyn Nine-Nine would have been quite a thrill. While Veep finally snapped the streak of Modern Family (a welcome shift in the winds), and it's an entirely deserving show, Parks or HBO's sharp Silicon Valley would have thrilled me too, probably a little more. When the fact that there are other people who also could have won for whom you also could have been happy is your biggest gripe about a three-hour awards show that didn't even feel particularly long and was brought in on time, things are going pretty well.